Wild: Cnidaria omnimorph is another example of a creature which should not exist. It has traits that seem to come from many types of jellyfish. It posses the size and shape of large egg-yolk jellies, the powerful sting of certain box jellies, and the bioluminescence of deep-sea jellies. This all combines to make a dangerous creature that lights up the deepest reaches of the ocean. Domesticated: As Cnidaria is barely more intelligent than a plant, there’s no effective method to tame one. though dangerous as they can be, a few tribes even keep schools of them around to harvest. 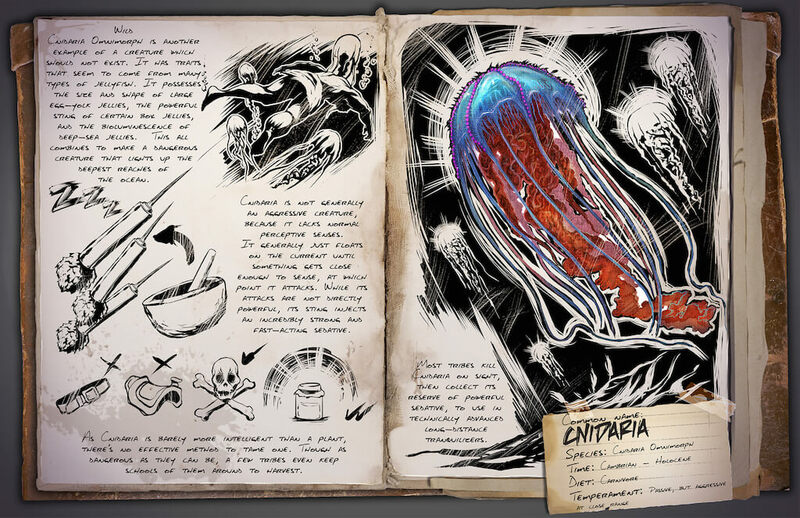 Known Information: Cnidaria is not generally an aggressive creature, because it lacks normal perceptive senses. it generally just floats on the current until something gets close enough to sense, at which point it attacks. While its attacks are not directly powerful, its sting injects an incredibly strong and fast-acting sedative. Most tribes kill Cnidaria on sight, then collect its reserve of powerful sedative, to use in technically advanced long-distance tranquilizers.